These Dean V Select Quilt Top Electric Guitar features a satin neck for ease of playing and endurance, a mahogany body, a 3pc mahogany neck, a 22 jumbo fret Ebony Fingerboard, easy access set-through construction, a beautiful quilt top with matching headstock, exclusive Seymour Duncan TB5 and APH-1 pickups in a zebra parchment finish and sand blasted pole pieces to set the look apart from the rest. 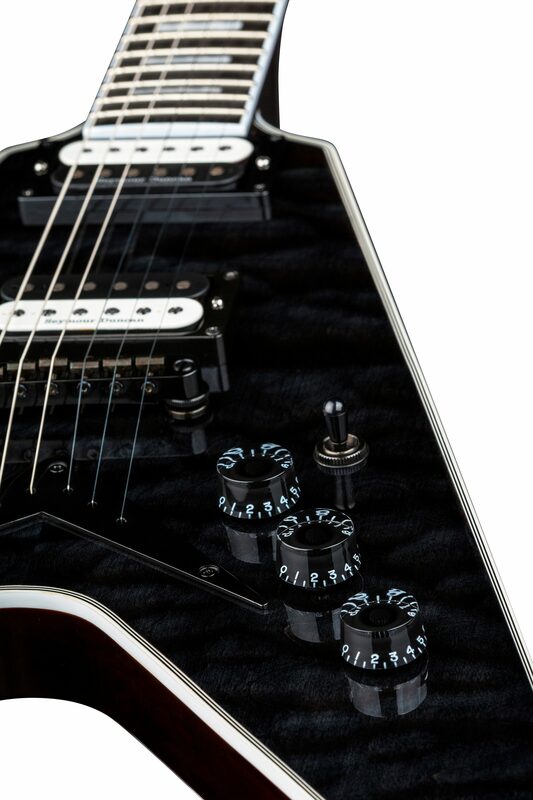 A Tuneomatic bridge with string through body tailpiece adds sustain. To top it off, 5ply Body and Headstock binding with single ply Neck Binding adds that extra splash of class. zZounds is an authorized dealer of Dean products. close [x]More ExpectedWe have been given a date of Apr 29 for the arrival of this item. This date is not guaranteed, rather an estimate based on either information obtained directly from the manufacturer or historical delivery data for the specific manufacturer.